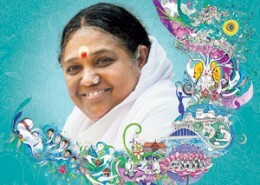 After all the charitable announcements and official stage functions wrapped up Amma began to embrace each and every person that came to the program. Afternoon stretched into evening, evening into night and then night into morning and still the people kept coming. All throughout, there were different cultural performances including a full range of dance and musical styles. Embrace: one of those last people in the Darshan line. 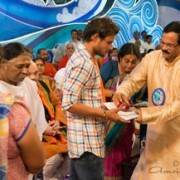 Darshan over at 11.am. 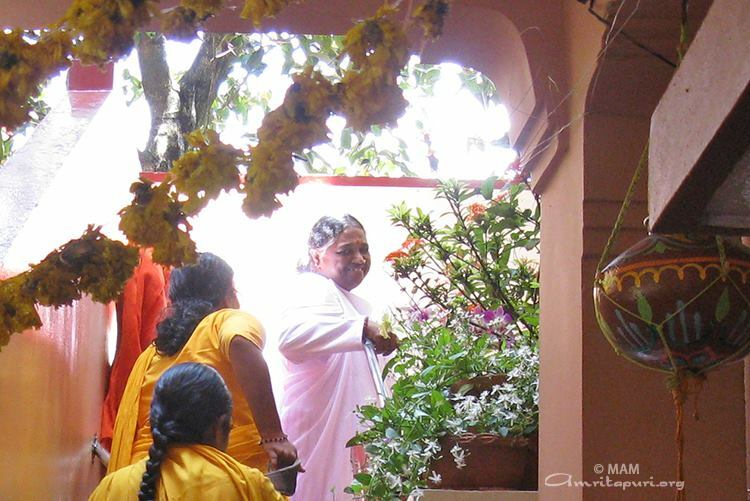 Around 10am it seemed the darshan was finally coming to an end but Amma noticed some groups of students out in the crowd that had not yet had Amma’s darshan. 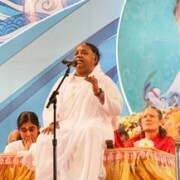 Amma took a microphone and told anyone that had not yet had darshan to come join the line. So just when it looked like it was almost over another several hundred people came running to join the line. 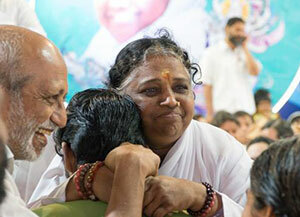 Tears filled the eyes of many of the people who Amma called for darshan as they were overcome with emotion, feeling the compassion that compelled Amma to sit another hour for them. As the darshan was wrapping up many people in the crowd began dancing to the Baduga music that was being played on the sound system. 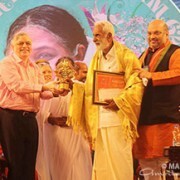 Amma herself joined in and in her own graceful way, mimicked the gestures of the dancers. 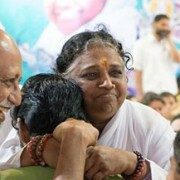 At 11am Amma finally embraced the last person, a full 26 hours after arriving on the stage and began to make her way back to the ashram. 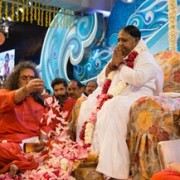 During the short boat ride back to the ashram Amma was told a group of villagers somehow had missed their chance for darshan. 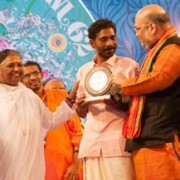 Immediately Amma asked them to be brought to the ashram. Amma awaited their arrival and proceeded to give them all darshan standing by the boat jetty, making sure not a single person missed their chance to meet her. After making her way to her room through throngs of people, Amma finally walked up her steps close to 12 noon. Before entering her room Amma turned back and flashed a loving smile to all present. Amritavarsham 62 is over. But the celebrations will continue in the hearts of her children for ever.